It’s been over 5 years that SEBI made it mandatory for all mutual fund houses to offer direct plans. Even so, around 90% of retail individuals still invest in regular funds as they don’t know the difference between regular and direct plans — the ridiculous commissions paid out from their investment on regular plans for as long as they are invested. The reason for this is because businesses/distributors don’t have any incentive to sell direct plans and let go of all the earnings that they make selling regular plans. Also, since we Indians don’t like paying money for just advisory, it is extremely tough to set up a business just around selling direct mutual funds. We started Coin with the goal of helping investors save commissions by offering them a platform to invest in direct mutual funds without any hassles. By offering them in demat mode, we not only offer the convenience of a unified portfolio across equity, mutual funds, ETFs, bonds, currencies and commodities, but we can also settle mutual funds similar to stocks – hence reducing our business overheads. This has helped us build a sustainable platform while still offering direct mutual funds where we don’t earn any commission from the fund house. We launched Coin web in April 2017, and just over a year later, 80,000+ investors have invested over 2000 crores collectively saving 30+ crores in commissions – making Coin India’s largest direct mutual fund platform. * Special thanks to the BSE StAR MF platform for enabling all of this. Dematerialise your existing investments and track them on Coin. Dematerialisation charges will be waived off until 31st October 2018! Read more. 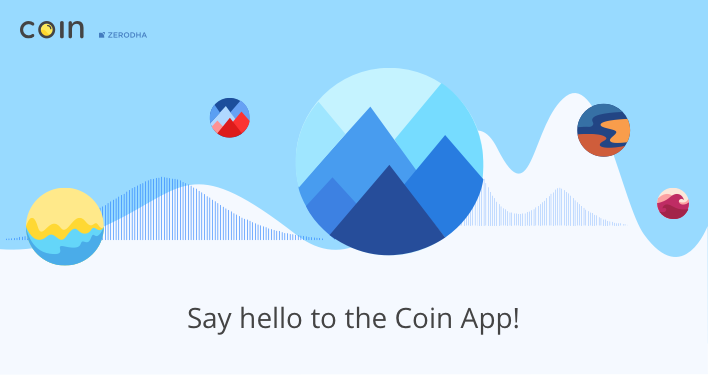 Today, I am super excited to announce the launch of the Coin Android and iOS apps. You can log in with your Kite account to start using the app. 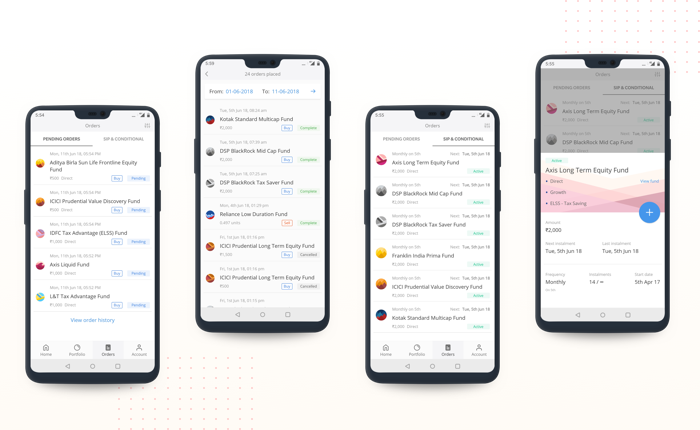 Once logged in, you will see a brief snapshot of your portfolio, list of top funds being bought on the platform, and the best funds in the category to help you get started if you aren’t sure. In spite of the scheme re-categorization mandated by SEBI there are still over 3000+ mutual fund schemes in India, and choosing the right fund can be a tedious process. With that in mind, we have built the Coin search to make the process of finding and selecting a fund as easy as possible. Click on “Explore” once logged in. You can directly search for a fund or browse across debt, ELSS, equity, and liquid fund categories. You’ll also see sub-categories under debt and equity to further simplify the process given, the wide array of funds under these 2 categories. You can easily filter funds based on the AMC, scheme type, minimum investment, CAGR and more. Investing on Coin just takes few seconds. Search for the fund, select the mode of investment – SIP or Lumpsum, enter the amount you wish to invest, select the frequency, and you’re done. If you’re new to mutual funds, then check out the “Get started” section. We have created a few FAQs to help you familiarize yourself with the concept of mutual funds. You can check the funds invested and P&L in this section. You can now also track XIRR of your portfolio along with absolute return % (By selecting your preference in the “Account” section). If you wish to make additional investments or redeem a fund, just click on the respective fund. You can also filter your portfolio based on the invested amount, current value, and P&L. Check this post to know more about XIRR and right ways to monitor returns of your portfolio. Search for the fund of your choice and place an order or set up an SIP in just two taps. You can also place a conditional lumpsum order to be executed once a certain NAV is hit, set order frequency and the number of instalments for SIPs or create SIPs that will stay alive until you stop them. View the funds 1, 2, 3 and 5-year CAGR, the current NAV, expense ratio, and exit load and place well-informed orders. You can easily track the status of your pending lumpsum & SIP orders, and order history from the orders section. You can track your subscription, manage funds (add and withdraw), set the portfolio returns preference (absolute, XIRR) from the account tab. You can now transfer funds using UPI. Soon you will also be able to set NACH E-mandates online to debit funds directly from your bank account for SIPs. If you like Coin, you can also help us spread the word by inviting your friends. For more, you can check out app FAQs here. Hopefully, all of you like the app. Download it here. Help spread the word for direct mutual funds among your family and friends – you will be helping them save and earn a lot more in the long run. Discovered it a couple of days back, used it and loving it. I have been using Kite and Coin from last two years and I am happy with Hassel free investing. I just have one question, can we do systematic Transfer from liquid fund to SIP by using Coin app? I couldn’t find answer in support section, it is not having option to send specific questions. Please help. Any updates when one can get STP and SWP support in coin? Hi Anurag, this will take us some more time. This STP/SWP execution logic has to be built on our side since we don’t rely on AMCs for this. Great step Nithin..Can we access Kite from Coin android app?..Login again to kite? Hey Gopal, since they’re 2 different apps, you’ll have to log into each separately. Can we block some fund for SIP so that regular trading will not consume money from this fund. Like MF account, Trading account etc. Hey mahendra, this wouldn’t be possible. However, as Nithin has said in the post, we’ll soon add a e-mandate feature so SIP amount can be deducted from your bank automatically. Eagerly waiting for STP from long time. It would help to move the investments on auto-pilot. Please bring it on asap. Thanks. Do you have date to start STP/SWP? Hey Sameer, we’re working on this. I’m afraid I can’t give you a concrete release date right now though. multiple arsenal for investors in recent days — nothing for traders !!! please bring something amazing for traders like me…. Hey Madan, Sensibull is still in beta phase. We’ll announce it once the team is ready with the platform. I knew there was something developed by zerodha where we could develop something without coding but didn’t know where it is. I was searching it in “studies”. Is there any thing similar to Sensibull for futures as well ? This app is lovely! I just love the UI and how easy it is to use!! Kudos to the designers of this app!! How can we place regular order from coin app ? It is not showing mode regular/direct in any place. Is it listing direct plan only in app by default ? Hi Rama. Not sure what you’re referring to, but the Coin app only shows direct funds. If zerodha doesn’t earn commission from mutual fund organizations then from where they are generating income? Hey Prakash, since we only offer direct funds where no commission is passed back from the AMC, we charge a Rs. 50 monthly subscription fee for the platform for investments above 25k. Thank you Nithin for all that you are doing for us retail investors! More power to you! Since most advisor are still hung up on making commissions via regular mutual funds. It would be great to have an approved advisory list for us to seek honest advice from according to our goals and tenure and invest in direct mutual funds ourselves. Hey Ankit, as Zerodha, we’ve always stayed away from the advisory field as we’ve believed that predicting the markets to a degree of accuracy at which a business can be built is nearly impossible. You can check out the list of registered investment advisors (RIAs) on the SEBI website and consider getting in touch with one of the more reputed ones. I want to open trading account at Zerodha but i have already trading account at SBICAP Securities. Can i still open account at Zerodha? If not can you tell me what is the process to transfer my account from SBICAP to Zerodha? 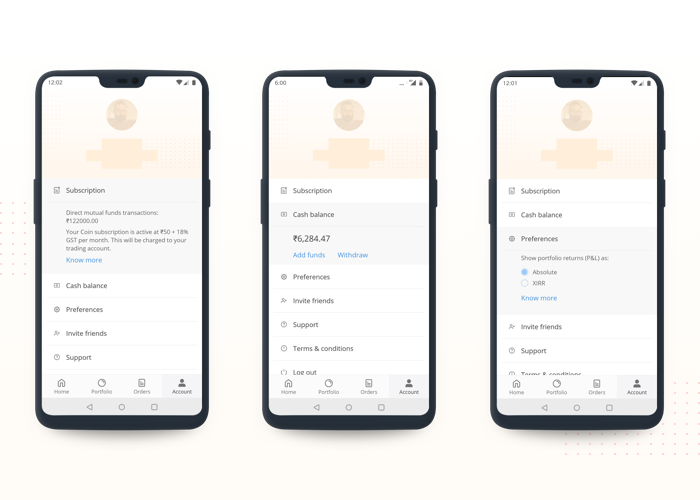 What is the charges for transfer funds from bank to Zerodha account & from Zerodha account to bank? Suppose i want to transfer 1,00,000 from bank to Zerodha account & 1,00,000 from Zerodha account to bank, then how much will be charged on each transfer? Hey Kiran, you can open any number of trading accounts. So, yes, you can open an account with Zerodha. We don’t charge anything for fund transfer via UPI. Netbanking transfers are charged at Rs. 9 + GST per transfer. There are no charges for withdrawing funds from your Zerodha account back to your bank account. More details on fund transfers here. I have applied to open account at Zerodha. Is there any way to transfer shares from SBICAP account to Zerodha account? How can i transfer shares? Hey Kiran. This is explained here. Just installed the app. its awesome. UI is neat and clean. Thank You. Hi Team, i a zerodha user. I felt the charge of 50 per month is too high for a small investor. 2: what is the procedure to onboard my existing funds to coin platform and do you charge for that funds as well. If Rs. 50 is too much (that works out to Rs. 600 flat fee per year) then you should going for regular plans of the funds, who charge far more than Rs. 600. The brokers who charge their fee (like FundsIndia) don’t care if you’re a small investor. They just cut your wallet. Hey Anil, to answer your question on pricing, yes, you will be charged for the transferred in investments as well. Also, as Nithin has mentioned in the post – “This has helped us build a sustainable platform”. For us, it works out with even as little as Rs 50 because this is a continuation to our primary business of allowing people to trade stocks. I know currently, we are all spoilt by choice with all the cash backs and free offers fueled by VC money pouring into Indian startups. But this ain’t going to last forever. When it stops, only platforms that have a revenue model will survive. It is important for you to be cognizant that unlike an online shopping portal where you are there only for that transaction, your relationship with a platform for investment is much longer. As for adding existing investments on Coin, you’ll have to get them dematerialised. The process for dematerialisation is described here. In light of the launch of the Coin mobile app, we will be waiving off the dematerialisation charges for our mutual funds until the 31st of October, 2018. We still cannot create customized baskets to group the SIPs we’re investing in. Like Portfolios. That would help track our goal wise achievements. Requesting you to bring this feature. Hey Pratap, on our list of things to do. I like the coin app and its neat and clean design. If below features are added then it will become awesome. 1. Provide an option to create a model portfolio(kind of short listing) before start investing in a MF scheme. 2. Provide suggestions of Mutual Fund investments as per Investors’s Goals. This will help to new investors in deciding which fund to invest. 1. On our list of things to do. 2. We’ve intentionally stayed away from the advisory space as we don’t see any real value we can add for you here at this point. Advice has to be specific to each user and has to take into account a lot of factors to create a holistic portfolio that suits an investor. 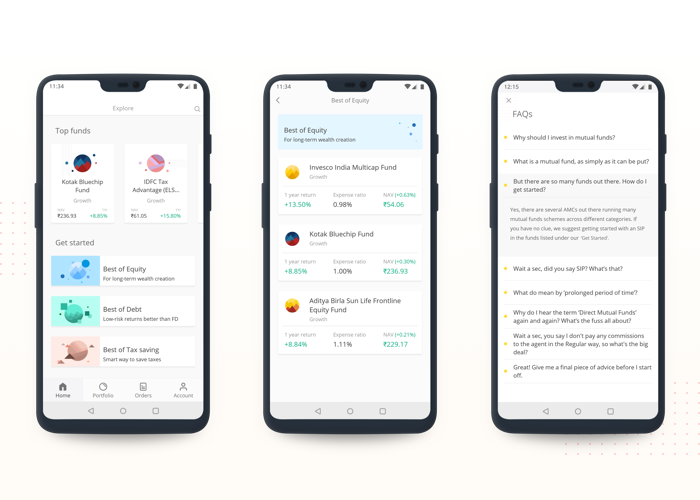 A generic, rule-based advice engine that takes a couple of parameters from you to suggest funds isn’t really adding any value to your investments. IF YOU PROVIDE STP’s THEN IT’S A VERY USEFUL, UNIQUE & FABULOUS APPS. Any chance of being able to this in the future?? Hey Vaibhav, for investing on Coin, you’d need a Zerodha trading and demat account. Unfortunately, trading accounts for minors aren’t allowed. What you can do here is to open a trading & demat account for yourself to purchase the funds and just a demat account for your child to transfer/gift them to. This is certainly a welcome move. Thanks! 1. Just wanted to know if an investor can open a “coin” only account with Zerodha? (Would be ideal for people like my parents who would like to invest in MFs only.). With the coin app, everything else is sorted for direct MF equity investments! 2. The demat charges applicable for redemption of mutual fund holdings from coin seems to be Rs.6.49/- per redemption. Is this charge applicable for partial redemption also? Frankly I was surprised at the levy of this redemption charge despite the monthly coin fee of Rs.50/- plus taxes. Nevertheless, please clarify if this is applicable for partial redemption too and see if you can waive this entirely as systematic withdrawal of funds would become less lucrative if partial redemption is charged. 1. A “Coin account” is essentially a Zerodha trading & demat account. If you’re only using Coin, nothing changes for you as a user. @Nithin, I don’t understand your idea to keep separate apps for Stocks and mutual funds ? Any reason to keep the separate ? Anyway, i love the products coming from zerodha. keep doing good work. The idea is that mutual fund investing and stock investing are completely separate activities. Having all these functionalities in a single app would create a lot of clutter. Not everybody does both, so, for the greater good, we’ve kept this app separate. Then why charge them together? Why not separate that as well. As a MF only investor, I do not need trading account. But the current setup forces people to open trading account as well and pay for it. You’d need to transfer funds to the trading account in order to invest in MF since we can’t debit the bank directly. I had been investing in direct mutual funds for a while now. I tried coin and liked it. I intend to transfer and consolidate my entire corpus into coin along and them make fresh investment through it as well. But I am not sure if transferring direct MFs is support. Please advice. I would like to start investing on Coin but only when I have every thing consolidated at one place. I hope my question makes sense. Thanks! Hey Sahil. You can indeed add your existing investments on Coin, you’ll have to get them dematerialised. The process for dematerialisation is described here. In light of the launch of the Coin mobile app, we will be waiving off the dematerialisation charges for our mutual funds until the 31st of October, 2018. Did you stop charging on direct mutual fund !? Because paytm launch direct mutual fund and they are not charging for it , policy bazar also doing the same ..
How can import my CAMS mutual funds? You can add your existing investments on Coin, by getting them dematerialised. The process for dematerialisation is described here. In light of the launch of the Coin mobile app, we will be waiving off the dematerialisation charges for our mutual funds until the 31st of October, 2018. Hey Arun, not right now, but soon! Sir, I am not able to search regular funds in Coin app, as It can be seen on coin website. Please include Regular Funds list in Coin App also. Hey Pradeep, Coin will be a direct only platform. Have you provided an option to upload existing MF portfolio in Coin? Hi Amrut. You need a Zerodha demat account to invest in mutual funds through Coin. IL&FS account holders cannot invest in MF through Coin. Can we track our existing portfolio through the app..
Hey Manoj. You can dematerialise your MF holdings and move them to Coin. More details here. Hi I have mutual funds invested offline. Can I bring that MF holding to coin. Does it incur any charges. Hey Manjunath. You can dematerialise your MF holdings and move them to Coin. More details here. nithin bhai, you are a god. Teach me!!! My dad account is axis bank demet account I want to transfer that account to zerodha kindly share te procedure. Hey Vinod. You’ll have to open a Zerodha account for your father then submit a closure-and-transfer form to Axis (obtained from them) with the Zerodha demat account details. my account showing balance in( -)minus .may i know about this? why it is showing? Hey Ashish, you would have sold holdings form your demat account, for which DP charges would have been deducted. I suggest you create a ticket here for more details. Looks amazing! Eases monitoring portfolio and the ordering process and even allows placing conditional orders. But my favorite feature from all was to Add funds with Tez, a very neat idea! I guess the quickest way to add funds to Zerodha account! Just installed the app. The UI is wonderful, world class experience and very smooth infact. It mean no additional charges? No annual charges? If its their how much? Hi Prasad, the first 25,000 worth of investments on Coin are free. Thereafter, you’ll be charged Rs.50 per month. More here. Is there any ‘Sharia Compliant’ ELSS mutual fund to invest? Hey Althaf, I’m afraid not. All ELSS funds hold at least a few banks. Is it possible for us to start SIP in small caps funds of SBI and Reliance where only SIP allowed with this app ? Not right now, Ram, but you’ll be able to do so come July. Hey Abhijit, MF pledging isn’t available right now. I hope this company becomes the pride of the nation someday. Please Nithin Sir, let me buy some Zerodha shares.???. How can one check if her/his Mutual fund (bought at coin) is already in Demat form or not? All investments on Coin are in demat mode only, Akarsh. What will be the charges for transacting and demat account charges for the MF account. I am a very small trader on zerodha. I may consider transferring my MF investments in direct as well as regular schemes. I have opened accounts on each fund house and hence I have to track each acc seperately. Hey Prakash, we charge Rs. 50 per month for overall investments above 25k. No transaction fees as such. There will be a DP charge of Rs. 5.5 + GST when you’re redeeming funds. Hi Nitin, Thanks for the new app. Liked it. Hi Nithin, great news and app! Question: Are there any charges/fees for adding money into Coin app every month? Since, bank ECS is not supported, it’s hard to remember to add money into our trading account. Hope to see ECS in near future. No charges for UPI & Tez transfers, Pradeep. 🙂 We’ll have E-mandates available soon. Thank you for writing to Zerodha Support. Please note, if you transfer the amount through instant payment gateway facility from any of the platform of Zerodha for payin then Rs.9 plus the service tax(18%) a total of Rs.10.62 per transaction will be charged as we need to pay it to the Atom payment gateway our service provider. This amount is charged on every transaction irrespective of the volume. In case you want to avoid this then transfer the funds through NEFT/RTGS/IMPS. Hi Ram. I see that there are no such charges on your ledger. Can you please share a screenshot in an email to social[at]zerodha.com? Will have someone check this out. I am waiting for the STP in the COIN. Any idea when will it be implemented in COIN? We’re working on this Sanjib. Will take us a little time. Will a person always be logged into his coin account or will it auto log out after sometime? Hey Akarsh, we’ve built the app so that you can log in once and then stay logged in until you logout manually. We’ll soon also add a PIN auth to the app. 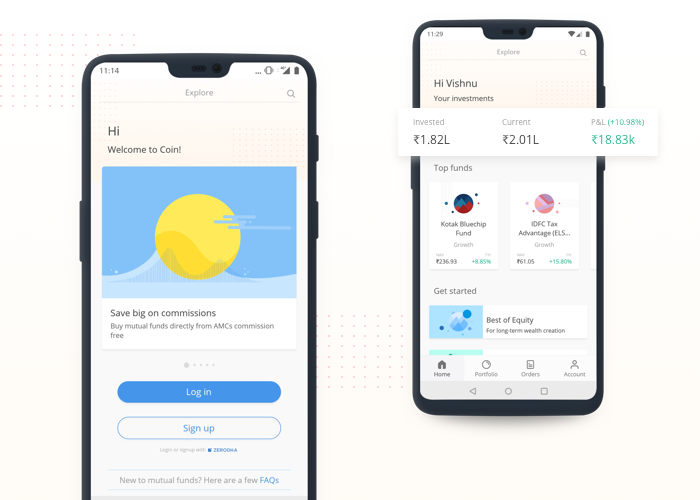 – Why you guys are making separate app (COIN) for MF? Option should be added in kite app only. 1. Coin is a mutual fund investing platform, Kite is a trading terminal. The two were intentionally kept separate so as to not add too much clutter into one platform confusing users. 2. We don’t require bank details as funds from the trading account are deducted for MF investments. Also, as Nithin has said in the posts, we’ll also soon have e-mandates that will allow SIP instalments to be directly debited from the bank account. 3. IPOs can be easily applied for online from your netbanking using the ASBA service. All you need is the DP ID, which is available on Kite and Q. That said, we may consider this in the future. 4. Not sure what you’re talking about here. 1. So will you be removing the MF tab in Kite app? 2. If no, then, why would you guys not remove mutual fund tab from the kite app? We’ll allow users to monitor their investments on Coin, just not add features required to do anything else. Also regarding the e-mandate thing, if a user is happy with MF sip being deducted from trading account then will you guys let it be? Or will e-mandate become mandatory? Why another separate app for coin (mutual funds) ?. While its beautifully integrated with the kite app. Is have to maintain two separate apps !!!!! Coin is a mutual fund investing platform, Kite is a trading terminal. The two were intentionally kept separate so as to not add too much clutter into one platform confusing users. Will it be possible for you, to add more than 3 suggestions in every category. Like suppose I am searching for ELSS mutual funds. Then right now you are showing only 3 suggestions. Maybe you can add a list of top 10 recommended by you and a top 10 recommended by top consultants and so on. This is possible, but a longer list just means more confusion. Its good to see a dedicated app for Coin. But it would be great if you populate both Equities and MFs in the same portfolio screen..
One clarification — You are offering free dematerialisation of existing MF holdings. While doing so, my holdings in will cross 25K mark. So will you charge the 50Rs per month??? Hey Karthiram, you can, in fact, see your equity and MF holdings in the holdings section of Kite, and the backoffice, Q. Yes, once the investments cross 25k, the Coin subscription charge would be applicable. This is not fair. We are not investing through coin right..? moreover those holdings may not necessarily be “Direct” investment. Hey Karthiram, once you transfer these funds in, the platform would see these as investments being tracked on it, and you do get the ability to track them, sell them, etc, hence the charge. I have 39k in direct elss funds and 6k in equity fund(which is less than 25k). Still i got charged for 59 rupees for coin subscription charges. When i raised the ticket below is the following reply. Can you please explain. We tried to reach you on your registered phone number but unfortunately there was no response. Please note: previously coin subscription charges were applicable for both ELSS as well as non ELSS funds, but now we have waived off the charges for ELSS fund. Hence, if you wish to stop the subscription charges. Kindly deactivate it on coin. Please refer to this link to know the deactivation process. Hi Ram. Check out this post. If you had an active Coin subscription, you’d have to go to the ‘Account’ section on Coin and stop the subscription if your non-ELSS investments are less than 25k. It is good to have pin and fingerprint based login for the Coin app. It is tedious to login everything with username password and again 2FA answers. Once you login with Kite, you remain logged in. We’ll be adding PIN soon. I am a zerodha user and I would have found it difficult to rectify which is a mutual fund and which is equity. As you know many stocks are named like hell. But yes if a separate tab would have been given in kite dedicated to MF it would have been better. As nowadays there are so many apps eating out memory of the mobile. There is a separate filter in Kite holdings on the web for Mutual funds. The new Kite app will also have this, for monitoring, but you’d have to use Coin for transacting in them. Having everything in one app would just create a lot of clutter leading to confusion. Hey Raju, these are intentionally kept separate to avoid clutter and confusion. Hi Priyanka, what exactly do you need? Hi. This fund isn’t launched yet. The NFO is slated to close on 22nd June. The fund will be available on the platform in July/August. 2. Possibly try to list sector allocation details of a MF. Currently a user has to navigate to various websites to find out more about a fund. 1. Perhaps in the future. 2. The MF holding data is only published once every quarter and the holdings may change in between these three months. As such, we didn’t see the value add this data would have since there can be no guarantee that it is accurate. Recently I had some issue in XIRR of one of the fund and i raised a ticket after fixing the ticket now for all the funds XIRR is shown as 0 and the Customer care Exec says that XIRR will be shown as 0 till the completion of 1 year!!!!. When i tried to add funds from Coin App, i m getting error as “Invalid Payee MCC Code”…. what is the issue? There seems to be an issue with some UPI apps. Can you try transferring through another app, like Tez? Can we block some fund for SIP so that regular trading will not consume money from this fund. Like MF balance, Trading balance etc. I’m afraid that wouldn’t be possible any time soon. I would like more features to make it complete. 1. Is it not possible to show list of stocks in a fund and it’s holding percentage? At least sectors percentage? 2. Search by scrip name and display list of funds who has the scrip. There are few costly shares like mrf, page, Bosch etc in which small size investors cannot enter rather would be interested in buying funds who hold them. 1. The MF holding data is only published once every quarter and the holdings may change in between these three months. As such, we didn’t see the value add this data would have since there can be no guarantee that it is accurate. 2. Again, since the data is delayed, this search may not be accurate, hence not something we’ve added. I wanted to ask that will the TER expenses will be deducted if we invest directly in mutual funds? Hi Sarthak, yes, all funds have a TER, i.e., an expense ratio. The difference is that, for direct funds, this is much lesser as compared to regular funds. Few things I picked from above comments. Please comment. 1. Would this not be a useful feature? 2. Doesn’t this take away bulk of Coin app’s powers? I mean most (maybe) of us, would apply for MF, would only want to monitor MF, & be done with it. (Think small investors). Not to mention that funding of coin occurs through kite only (as of now). Since basic life cycle of MF is covered in Kite app itself, doesn’t this take away bulk (not all) of coin’s powers? 3. Why is the Rs. 50 + 18% GST charged? To keep the kite app running? 4. Wouldn’t this make Coin more independant? Then why keep the MF tab in Kite app? Wouldn’t it be better if these two were completely seperate apps? I mean there are people who only want to invest not trade. I even tried to get my mother to invest but in the end she told me that if it was only MFs then she would, but, one would also have to take care of the trading account, on top of that pay AMCs for not using the trading account. 1) This is quite complicated. Assume that you hold a derivatives position and there is a sudden movement in the markets, the margin requirement changes in a split second. It’s not practical to have these limits. We are very close to integrating E-mandate and that takes care of this request. 2) It’s a choice right, you can still do it only through the Coin app and not login to Kite. 3) The Rs.50 is the subscription fee for Coin. There is a cost involved in maintaining the platform. Hmmm, Kite just shows the basic P&L and nothing else. We have added XIRR in the Coin app which is the right way to track the performance of your MF investments. We’ll soon have other analytics in the app. 4) I believe the same answer as above applies. They are meant to be different, Kite is a trading platform only. I’ve MF in Demat form in another company. How may I transfer that in Coin? I had also had word from Saleesh ji, that Q will be updated. I’ve transferred my entire stock from another Demat to Zerodha, but average price and PnL report are not correct. Plus manual error from my side as not rectified since more than 6 months. I’ve two choices, switch entire Zerodha to other account, as I’ll already get correct PnL and services or switch my 3rd Demat into Zerodha, if Zerodha provides better service. I like your model, plus it’s pocket friendly. But if it’s without service, it turns difficult. I’m fed up of multiple accounts. I’ve turned from 4 accounts to 3 now, and next is from 3 to 2. Help me make a choice. Hey Vinit, here’s the process of moving your mutual funds. As for your queries about average prices and P&L, can you please create a ticket here. Hey Vinit, here’s the process of moving your mutual funds. As for your queries about averages price and P&l, can you please create a ticket here. Hey Vinit, here’s the process of moving your mutual funds. As for your queries about averages prices and P&l, can you please create a ticket here. While I am checking available mutual funds on Coin, I observed few of mutual funds are unavailable. (Example SBI small cap mutual fund in unavailable on Coin). 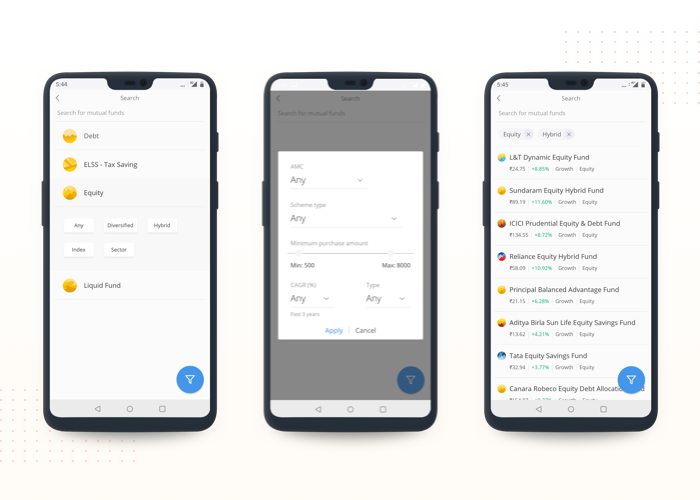 Just wanted to share this so that all mutual funds will get available to users and app will be more useful. some mutual fund allows daily purchase also. can i do same in zerodho too? then hdfc mutual fund have flexi sip plan. can i get same plan in coin too ? Hey Manikandan, daily SIPs aren’t possible currently. We are working a different variant of a flexi SIP, we’ll keep you posted. Just out of curiosity, the Coin app built in Flutter? 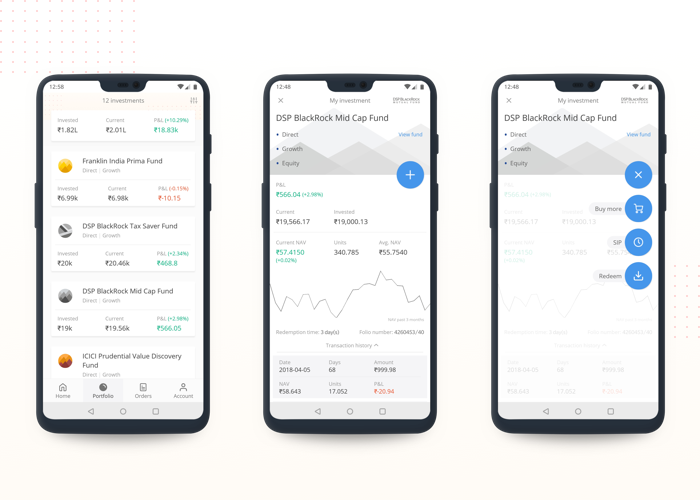 for many years i was always looking for an mutual fund app for both demat and otherwise, on a single platform.Would coin app have this in place.any plan in future? Also please could the net worth be plotted on a chart and offered against a value added service .I am sure there would be many takers. Hey Samir, you will have a unified portfolio view soon. We’ll soon have a visualization that shows your account value over a period of time as well as a cumulative equity trigger. Used the coin app and liked it. The only draw back is that for liquid funds, im not able to get previous day NAV where i end up losing a day’s float. Can you pleade get it sorted asap coz as an investor i lose money if i wana do transactions via net banking as bank upi limit is 25k per transaction per day. So have to tranfer ends via netbanking whr i incur 10 rs as charges. Second im incurring loss for a day’s float as well. This is almost equivalent to investing in regular liquid funds. When you place an order in liquid funds to get the historical NAV through BSE STAR MF, the same has to be punched in the system before 1 pm. We follow a standard process of punching orders for all types of mutual funds (equity, debt and liquid) before 3 pm. Hence, you will receive the same day’s NAV except on a Friday where there is NAV released for a purchase order so you would receive the NAV of Saturday or Sunday.Otherwise on remaining days, you would receive the NAV of T-day itself. Hi , Great UI , I love that add fund option. its easy to use and time save. I am really glad to be associated with Zerodha, also I have recommended my friends to explore Zerodha some of them have already switched over to Zerodha from their earlier brokers. How can i receive contract note per stock wise, especially if lot of trades(CNC and intra both) were made on one day. I would like to receive contract notes script wise. I did raise a helpdesk ticket but no help. I am requesting this info since I am a new investor and would like to learn about various charges involved. Somehow numbers(total and avg. cost) are not matching with my records. I am looking for trades done by me on 15-June. Is coin only for mutual funds or are there any other uses as well? Hey Vedant, Coin is a mutual funds only platform. How do I join in coin platform? Just install the app and log in with your Kite ID and password. Quite interested in the coin app, but bit apprehensive over the longevity of COIN. Im investing in mutual funds for a long term, if Zerodha/ COIN vanishes in say 10 yrs time then wat will happen to my investments. Second question is the fee charged by COIN 600/ yr + taxes. is a bit on the higher side. Could anyone explain these two things to me. I am waiting for Zerodha to start giving out franchisee to individual entrepreneurs. Your business model is of zero or lowest brokerage so you may be shunning away from franchisee model, but believe me it is essential for last mile reach. Entrepreneurs like me are medium to bring variety of people to invest in share markets ( e.g. non smartphone users, busy persons or anyone who’s new to share markets). Giving small brokerage like 0.4% or so doesnt matter for many such people. Ultimately this will make Zerodha more popular. I would be happy if my suggestion matters to you. MF investment for minors…does Zerodha let account opening on behalf of minors? I want to start goal based investments for my son. I very much liked the Coin App of Zerodha. I wanted to invest in SBI Small Cap Fund Direct (Growth) through SIP mode, but, I was unable to find the SBI Small Cap Fund on the search bar of the Coin App. So, I wanted to know when this mutual fund will be made available on the Coin App. Thanks in advance. Hi Jatindra, we’ll be making investments available in this fund soon. This fund has stopped accepting investments in lumpsum mode, and since we use simulated SIPs, investments aren’t possible right now. However, we’ve built a solution for this that will be taken live soon. Hopefully in the next couple of weeks. 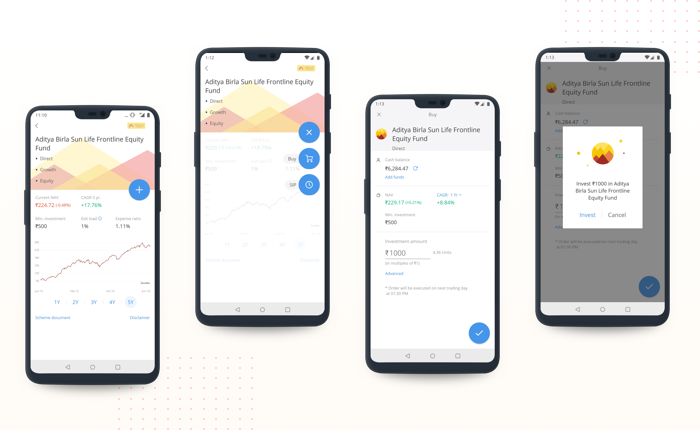 Good app with great features and well described about the complete app – I already used one more app named Advisorymandi its is really good app for stock market. We know that normally NSE send both SMS and email alerts for each and every trade. I have received both SMS and email alerts from NSE for my all trades before one month. Now I am receiving only SMS from NSE but no email. I want to get email alerts from NSE. I asked NSE and they replied me that broker is responsible to maintain all the information of their clients uploaded on NSE database so that their clients will receive both SMS and email alerts from NSE for their trades. Kindly note only SMS you will receive from exchange, Further contract note and margin statement you will receive in mail from our end. Sir, please solve the problem so that I wiil receive both SMS and email alerts from NSE and BSE for my trades. Hey Prabir, you’ll have to get in touch with the exchange for clarification on this. Hi Nithin sir, I am new in market. my question are- 1. Can I invest mutual funds less than 1 yr? 2. What is the minimum sip need to invest a mutual fund? 3. If my sip is 1000/month then after 2 yr I deactivated/exit the mutual fund then 50/ month is debit? Ex- 1000*24=24000. Not ₹25000 . Then what happened? 4. If I holding mutual funds 5yr then when i deactivate/exit the fund then capital gains tax apply for it? Plz answer. 1. Yes, you can invest in mutual funds for a period lesser than a year. However, some funds may have an exit load. Click here to learn about exit load. 2. You can start an SIP with an amount as low as Rs 100. Check out this link to view schemes according to the minimum investment value. 3. No, in this scenario you will not be charged the subscription fee of Rs 50. 4. Refer to this article for a detailed explanation. hi Sir , so I can save 50/month. If I always invested a mutual fund for 2 yr . Supposed I instead 2or 3 mutual fund in sip 500 and 1000 . After 2 yr I have not paid 50/ month. Then after 2 yr u charge any amount if I start a new mutual fund ? And what is advantage and disadvantages if I do it ? 1) Whether all MFs are having direct mode of investment ? 2) Whether all MFs allow SIP / Lumpsum in direct mode ? 3) Do I have to maintain DMAT A/c with you ? if yes, what are the different charges under different heads for DMAT a/c ? 4) Can I link my existing DMAT a/c, held with other organization, with my COIN subscription A/c ? If yes, What is the process ? and Whether the debit / credit to DMAT a/c is automatic ? 5) Can I trade my MF units in share market through your platform ? if yes, what are the charges under different heads ? 6) Other than holding charge for the COIN subscription A/c [ i.e. Rs. 50/month after crossing Rs. 25000 for non ELSS MFs ] irrespective of the total MF units & total value, do you charge for anything else like buying or redemption of MF units etc. ? 7) For regular MF option expenses ratio cover the fund and advisor expenses and NAV is adjusted accordingly. For direct MF option also expenses ratio is there which covers fund expenses and NAV is adjusted accordingly, plus additionally I have to incur your COIN subscription charge of Rs. 50/month i.e. Rs. 600 p.a. Can you give short examples for break even point where investment through COIN is advantageous. It says “This version is not compatible with your device” …. You platform is super exciting. But I am not using the platform because of the lack of STP functionality. STP is the best way to deploy large sum of money to the equity market. This way the investor’s money could get around 7% returns while it is getting regularly invested in equity funds for cost averaging. There are lot of investors out there who stay away from coin for the same reason. Could you please prioritize building that feature? Hey, STP is on our list of things to do and should be available soon. Thanks Matti for your response. I appreciate that. I am trying not to sign up for any other platforms. Can I ask you for an estimated date to have this functionality? To get me going, will you be able to setup STP in back-end, until you enable this functionality in the portal? So, we depend on BSE StAR for mutual fund order execution. They’re yet to get back to us with the APIs for STP. Once we get it from them, we’d be able to make it available on the platform within a week’s time. We hope to have this soon, but since this is an external dependency, can’t give you a timeline. STP is on our list of things to do, but it’ll take some time. In the meanwhile, you’ll have to manually redeem a fund and purchase the other.